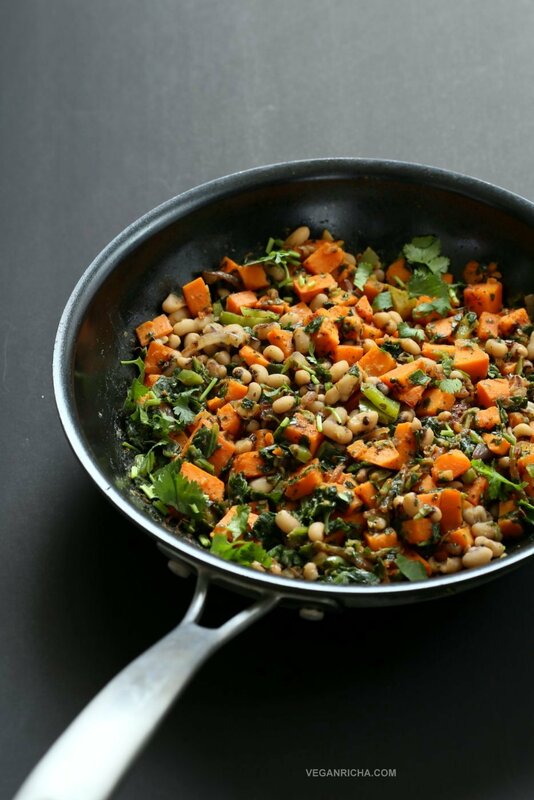 Bring in the new year with this plentiful 1 Pot Black eyed pea and Sweet Potato Hash with Harissa Spice. Ready in 20 minutes. Serve over toast with a creamy dressing or avocado. Vegan Gluten-free Soy-free Recipe. 2017 will be here in another day and we need some beans esp black eyed, sweet potato and spices! to bring it in. 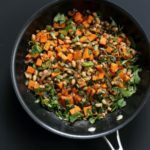 This sweet potato hash is super easy and comes together really quickly. 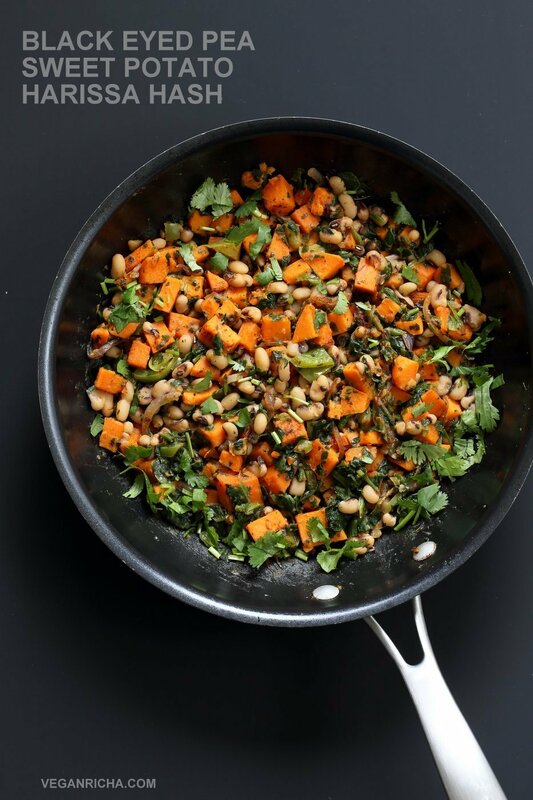 Sweet potatoes are cooked with onion and garlic in a skillet, then simply spiced with harissa and smoked paprika, tossed with greens and cooked black eyed peas. Pretty, hearty and wonderful. Serve the hash as a side or over toast topped with sriracha or avocado, fill up tacos, or make a buddha bowl with cooked grains like turmeric lemon rice and a dressing or lemon juice. So many ways to eat this amazing stir fry. Use other cooked beans or lentils and other spice blends like cajun or garam masala for variation. 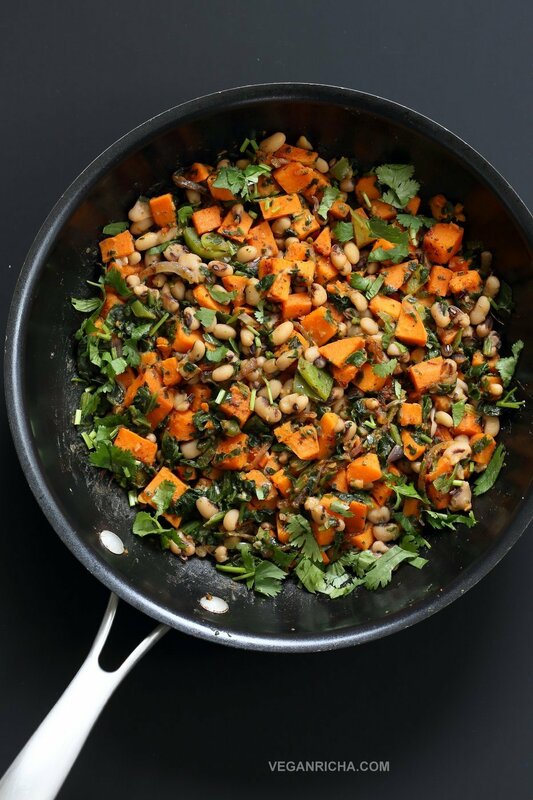 For all the black eyed pea prosperity and happiness, make this Deep Dish Lasagna Pizza with Black eyed Peas and Greens, Some Black Eyed Pea and Lentil soup, a grain-free Black eyed Pea and Potato Masala Pie stuffed with broccoli and cauliflower, or a hearty black eyed pea and Pumpkin Chard Chili. Be safe and happy this New Years eve! More Breakfast options from the blog here. Remind me to add a Savory breakfast category in 2017. Heat oil in a skillet over medium heat, Add onion and garlic and a pinch of salt and cook until translucent. 5 to 6 minutes. Stir occasionally. Add sweet potato, bell pepper, 1/4 tsp salt, thyme, harissa and toss well to coat. Cover and cook for 3 minutes. Add a splash of water (2 to 3 tbsp) and mix. Cover and cook for 8 to 10 minutes undisturbed. Stir and check if the sweet potatoes are done. Cover and cook for 2 minutes or so longer if not done. Add the black eyed peas and greens and mix well. Increase heat to medium high and cook for 2 minutes. Taste and adjust salt and heat. Add a tsp of olive oil or vegan butter, cumin, black pepper or more harissa spice blend, a dash of lemon and mix well. Take off heat. Garnish with cilantro and serve as is or with garlic bread or over toasted bread or tortillas. Or make a bowl with cooked grains, lettuce/greens and a dressing. * If using collard greens or other longer cooking greens, add collards at step 4, mix and cook until wilted, then fold in black eyed peas and continue. For variation: Use other cooked beans, lentils or chickpeas. One pot dishes are the best. I always love sweet potato in recipes and this look delicious. I’ll try making this soon. I’m thinking of using it in a buddha bowl with some quinoa and salad greens. I’ve seen so many recipes over the past few days with black eye peas it’s like the interweb KNEW i randomly picked up a tin last week! This is by far the most appealing to my tastes though. I oddly want it for breakfast!! Do you know of a recipe for harrisa? Here in Mexico they don’t have blackeyed peas, can I use black beans instead? I usually don’t like sweet potato but it’s very good in this recipe. ???? Do you mean 1.5 cups cooked dried black-eyed peas? If so, that would be about 1/2 dried, soaked overnight, then cooked the next day?? Thanks. Thank you Richa!! I’ve printed the recipe now and will add that note to it. I’ve made this recipe before – it’s DELICIOUS!! – but had forgotten about the bean question. Thanks! My husband and I really enjoyed this! I added a bit of vegetable broth instead of water and we ate it as more of a soup/stew in a bowl with homemade vegan sour cream. I loved the flavors. I’ve added it to my list of meals to make frequently. I NEVER comment on recipes but we loved this!